AMDA | AMDA News - AMDA Alum Chen Drachman Creates Her Own Web Series and Hits Her Mark! AMDA Alum Chen Drachman Creates Her Own Web Series and Hits Her Mark! 2011 AMDA alumni Chen Drachman has taken her AMDA entrepreneurial training to heart creating “Hit the MARC,” a webisode featuring a cast of AMDA alumni, filmed around New York city and in our historic Ansonia building. Chen wrote and directed the pilot episode with AMDA alum Camille Theobald (co-director and co-cinematographer). We spoke with Chen about her experience creating this new webisode and her plans for its future. Chen, you came to AMDA all the way from Israel. What brought you here? My director from home, Eidan Lipper, is an alum and for years I heard about AMDA. Three years ago I came to NYC to look at schools. After I finished my army service, I was initially planning to major in film however I always had a soft spot for musical theatre. Following my first trip to Broadway, I knew this is what I wanted to study. What inspired you to jump in and create “Hit the MARC”? As I got closer to graduation I asked myself “If I could do anything I want now, anything at all, what would I do?” And two of these answers were; “to go back into script writing (I was a cinema major in high school and script writing was my main focus), and to act in front of the camera.” With “Hit the MARC” I realized that I could accomplish both goals with one project. I was also inspired by Tina Fey’s biography Bossypants. When she was developing the concept of “30 Rock” someone had suggested that she write about her own experience as a head writer on SNL. 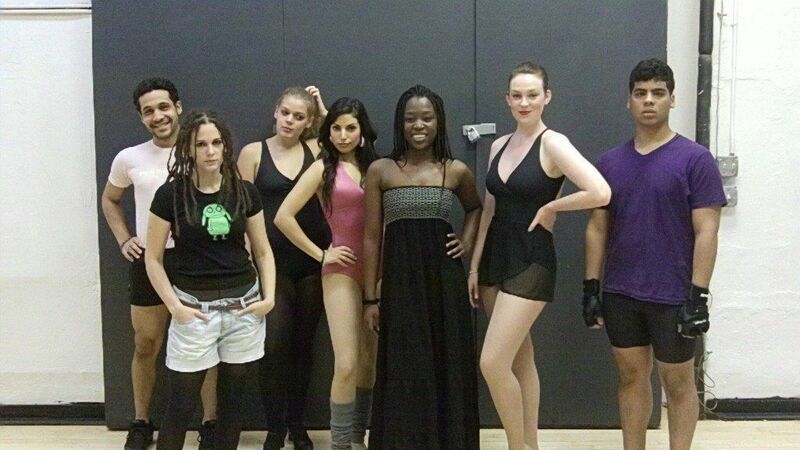 So I decided to write about something I knew, life in and around a performing arts school. I also recalled Mr. Dan Daily saying to us “don’t sit and wait for jobs, if you don’t have a job, create one.” And so I did just that. What would you like to see come out of this project in the future? I would love to see this grow, with a new episode created every two months and some fun shorts in between. Ideally we will have some Broadway guest stars, and maybe at some point even have a budget to work with. Of course I would also like to establish a solid fan base for the series. What did you base the storyline on? It is loosely based upon my own experiences, but it’s not a biography, and it’s not specifically about AMDA. It is more about those surreal situations and extreme personas that you meet in an environment like a performing arts school. It’s a comedy but we’re aiming for depth. I think the pilot gave us a sneak peak to that. I think it’s funny because the characters take themselves so seriously, but I hope to explore them further and touch upon subjects like sexuality, self esteem, acceptance and the compromises you have to make in life. Perhaps it is about the realization that your journey is different from what you had hoped. I also want to be clear that “The MARC” is the name of the school. It’s The Musical Arts Robertson Conservatory, a completely made up school. Again, the point was to create scenes in a place that was general as well as familiar. * And a special appearance from AMDA faculty member Billy Johnstone who plays the teacher. Check out the pilot episode on the web now, with more episodes coming soon!